Here’s a pillow made by Linda Teufel (Dragon Threads Publishing) from the book Silk Unraveled by Lorna Moffat/Dragon Threads Ltd. It’s a great project for using up silk scraps or small pieces. A beginner level project, you can’t really make a mistake due to the freeform nature of the embellishments. Assorted colors of silks. I used 4-1/2″ square pieces in a 5 x 5 format for the base but you can use assorted size pieces and patch them together to get the desired size of your pillow. Intersections don’t need to match and all pieces don’t need to be the same size. Think of it as a color base that will be decorated. Silk for backing, as needed for your finished size. Can be two different colors. Zipper for back if desired to use instead of overlapping back section. Variegated threads – one or two colorations to complement or contrast with your fabrics. Step 1) Create the pieced background. 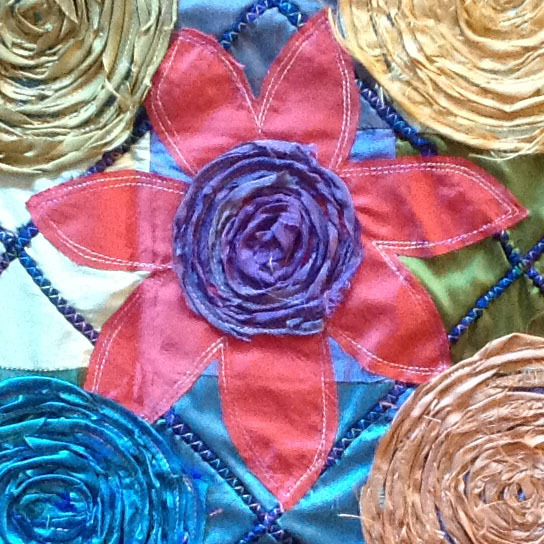 Stitch all the pieces together however you like using 1/4″-wide seam allowances and regular thread. Press flat. Step 2) Add the embellished grid lines. Draw some diagonal lines on the top with chalk. I centered the first set of lines from corner to corner and spaced them 6″ apart. Then I drew more lines, also 6″ apart. Turn and do the same for the other direction. Cut or tear an inch-wide (or narrower) length of silk in color that you want for the grid lines. Hopefully you can tear a piece long enough to cover your chalk line, but if not you can always piece it. Using the widest open toe foot that you have – I used Open Embroidery Foot #20C – and variegated thread, position the first strip at the end of a line and secure it with few stitches. Set a wide and long zigzag and use your fingers to twist and roll the silk so it is between the zigzag stitches; stitch, creating the effect of couched cording. If you need to join a second strip, just twist the end of the first one with the end of the new strip and keep zigzagging. Repeat for all the lines going in one direction. Then turn and complete the lines in the other direction, just crossing over the intersections. Step 3) Add the spirals and flowers. 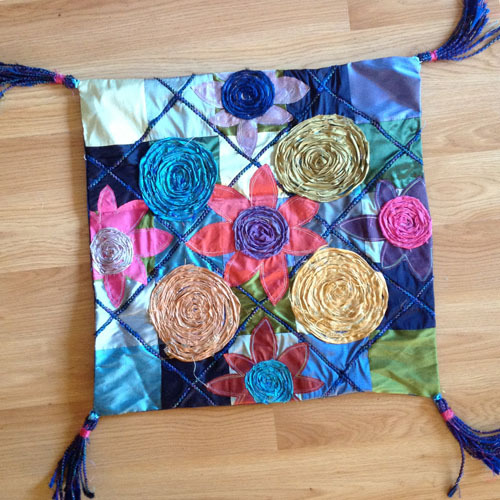 Decide which squares will have spirals and which will have flowers. Or use any other shape you desire – maybe hearts? Select your thread color. Tear a narrow strip (1″ wide or less) of silk. Place end in the middle of a square and catch with a few stitches to hold. You can do this with a free-motion foot and feed dogs down or with a quarter-inch foot such as Patchwork Foot #37. Continue to stitch the strip into a spiral, holding the strip in place as you sew. At the end overlap the end of the strip with the previously stitched round. Go over the stitching twice if desired. Don’t worry about the raveling; just let it be as part of the handmade feel of the piece. Cut a square slightly bigger than the gridded square on the pillow. Fuse the back of the silk with Steam-A-Seam 2 or a similar adhesive product. Freehand draw a flower with seven or eight petals and cut it out exactly. Peel off the backing paper. Place the flower inside the square; it’s okay to overlap the lattice lines. Fuse well. 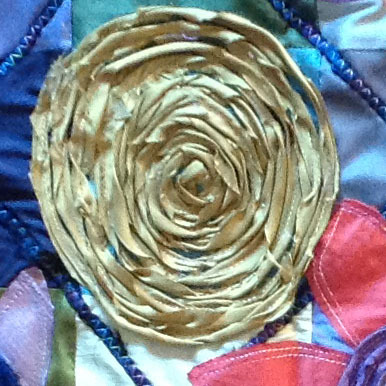 Stitch around the outside edges of the petals with variegated thread. Then stitch a second row close to first; it’s okay to overlap in areas. Step 4) Make the tassels. 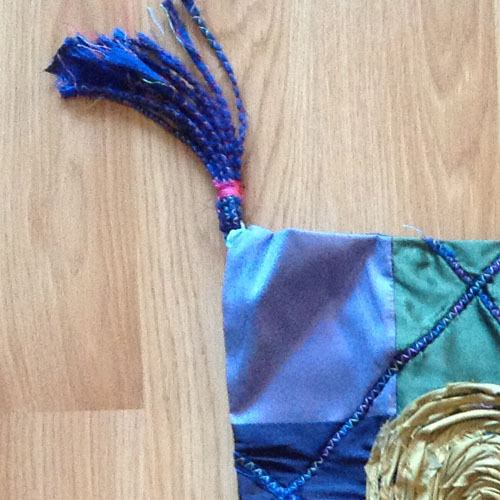 The tassels can be many colors and not just a single one as on my sample. Use up all your scraps! Tear 1/2″-wide strips of silk. Put on the wide open toe foot and set up your machine with variegated thread. Set the zigzag stitch to its widest width and a length of 3 mm. Roll and twist the strip between your fingers and lay it under the center of the foot, letting the zigzag stitches fall on either side of the strip without stitching into it; you want the stitches to wrap around the strip to form a “cord.” Repeat to make enough strips for four tassels. Cut the strips twice the desired length of your tassel. I cut my “cords” 11″ long and used seven (7) strips in a bunch for each tassel. Fold the cords in half and use a scrap of silk or ribbon to tie tightly in the middle. Fold the bundle over and, with regular thread in a hand sewing needle, stitch through one cord and then wrap the thread around the bunch a few times, go through a cord, then pull tight and let the needle hang. Cut a small piece of silk and wrap it around the thread. Take the needle and stitch the silk edges together and sew a bit through one cord to hold everything in place. Attach tassels to the corners of the pillow, with the tassel on the body of the pillow and the ribbon diagonally at corner. Baste in place. Step 5) Construct the pillow. Prepare the back of the pillow by inserting a zipper between two pieces of silk, or by hemming the overlapping edges of two larger pieces of silk. Cut the pillow back to the same size as the pillow front. 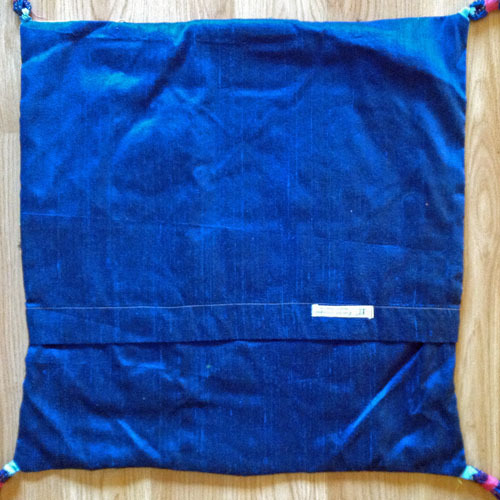 Place the backing right sides together over the pillow top; stitch around all edges, making a short diagonal over the tassel ribbons at the corners. Washing instructions: Soak the pillow in the sink with Woolite, rinse well, and hang to dry. Press. This project is from the book, Silk Unraveled, by Lorna Moffat/Dragon Threads, Ltd.
Visit Lorna at her Facebook page or Etsy shop.